The first time I went out to eat in Lima, it was in secret. It was the start of the 1980s, and Peru was in the midst of a civil war. There were blackouts and curfews—and very few people went out after dark. At the time, I was four years old, and my only friend was a man who worked as a sort of assistant to my father, who was raising four of us alone and needed the help. The man’s name was Santos. Santos was about 30, and he had a huge appetite. Like millions of other Peruvians who’d fled the violence unfolding in the countryside, we’d recently migrated to Lima from a town deep in the Andes. We all missed home. But at night it was Santos who always seemed most heartbroken. When I asked him why, he said that he no longer savored his food. 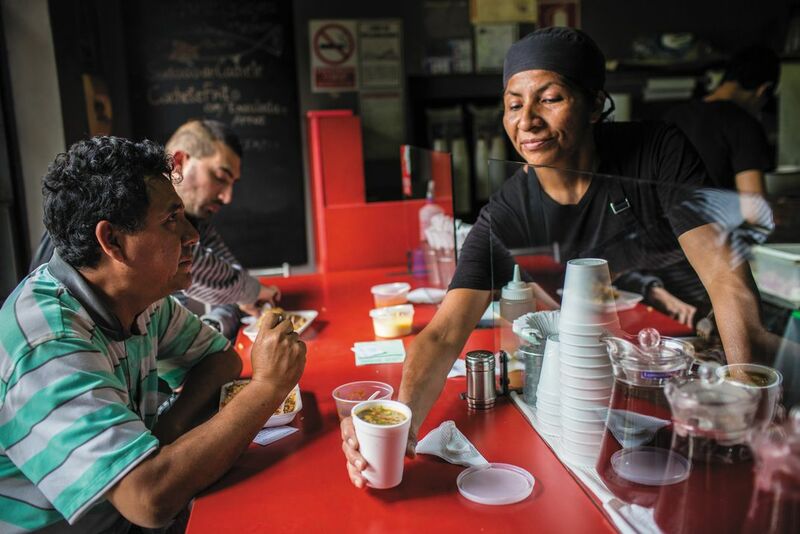 Santos soon discovered that the remedy for his sadness was the street food being served up by other migrants, and as he got to know his way around Lima, he turned into a different person. He became animated when he told me about all the delicious things you could eat in the capital. But for my sisters and me, going out there was still off-limits; the streets were a place where bombs exploded and people died. They were a place that my father—like many parents then—had forbidden us from visiting, especially after dark. 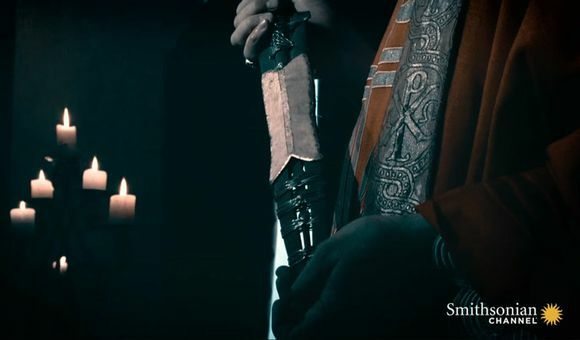 But one evening when my father wasn’t around, Santos decided to sneak me out. The Lima I saw that night was almost completely devoid of streetlights: a world of empty avenues and concrete apartment blocks, without a real restaurant in sight. It was nothing like the city that three decades later we’d be calling the culinary capital of Latin America—a city that journalists, chefs and visitors from all over the world would travel to in search of new dishes and chic places to dine. That night, Santos parked our car, then carried me in his arms to a dark corner draped in a cloud of fragrant smoke. 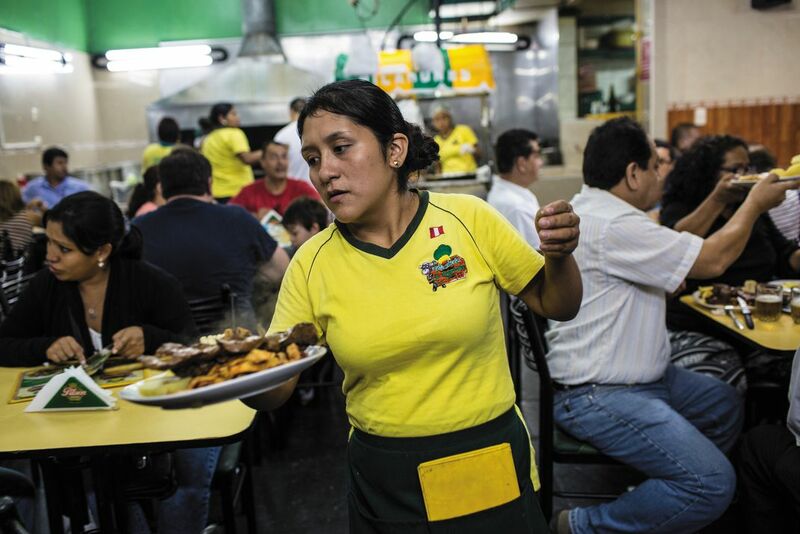 A woman stood over a small grill covered in the skewered pieces of beef heart that we call anticuchos, a recipe first invented by slaves who seasoned and cooked cuts of meat that their owners refused to eat. While today anticuchos are a staple in restaurants all over the city, in the eighties it felt crazy to be eating them out there on the street. Nonetheless, what I most remember about that night is not a sense of danger but the perfume of the marinade hitting the grill. Even if Lima was a sad shadow of a city, that smell was joyful. I think about that scene—and the city we once lived in—each time I go with my sisters to eat anticuchos at a working-class restaurant called La Norteña, tucked away in a neighborhood of family homes and office buildings near the airport. The owners started out in the 1990s, selling skewers in the street to whatever brave customers were venturing out. When the war finally ended and Lima became more prosperous, their business grew. At first it occupied the patio of the owners’ house. Then it expanded into the dining room and, later, through the entire first story of the house. Now it’s normal for a family to wait 10 or 20 minutes to get a table at La Norteña. 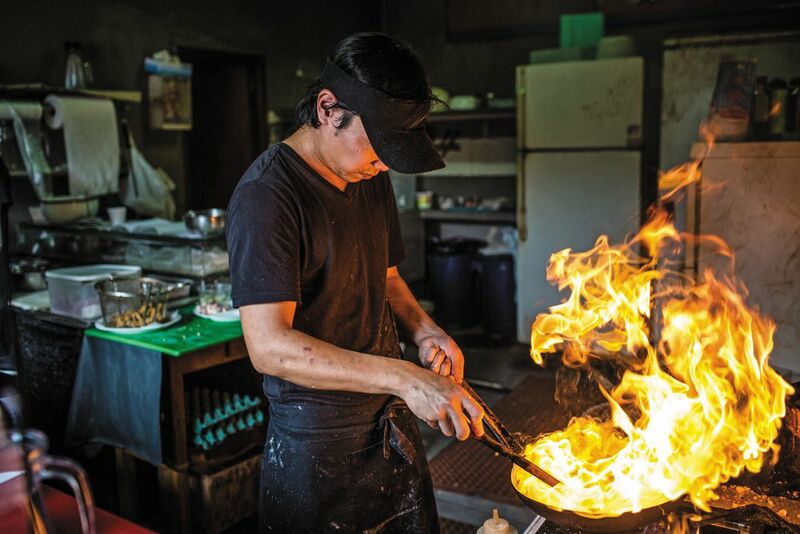 Matsufuji’s ceviches and stir-fry highlight fresh, humble ingredients from the sea, which Matsufuji picks out himself at the fisherman’s wharf in Villa María del Triunfo. 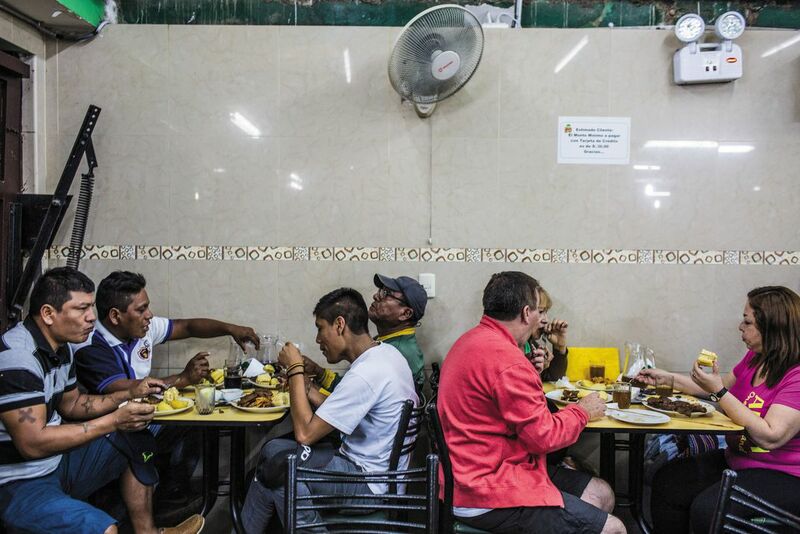 At Al Toke Pez, people who don’t normally cross paths—manual laborers, businesspersons, artists, yuppies, teenagers and tourists—somehow all end up at his narrow counter, eating elbow to elbow. 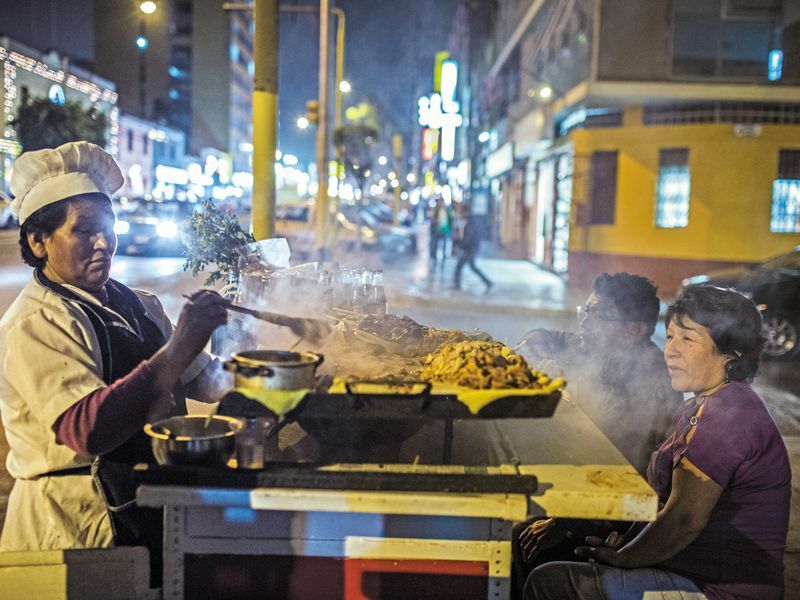 It might be the most democratic experiment to come out of the huge, multifaceted movement known as Lima’s culinary boom. In postwar Lima, we constantly use the word “boom.” We say there’s a musical boom, a publishing boom, a design boom. While the word smacks of commercialism, it also reflects a sense of national pride. But nothing compares with the pride we feel for our biggest boom, the one in cuisine. The great Spanish chef, Ferran Adrià, put it best: Food is a religion in Peru. 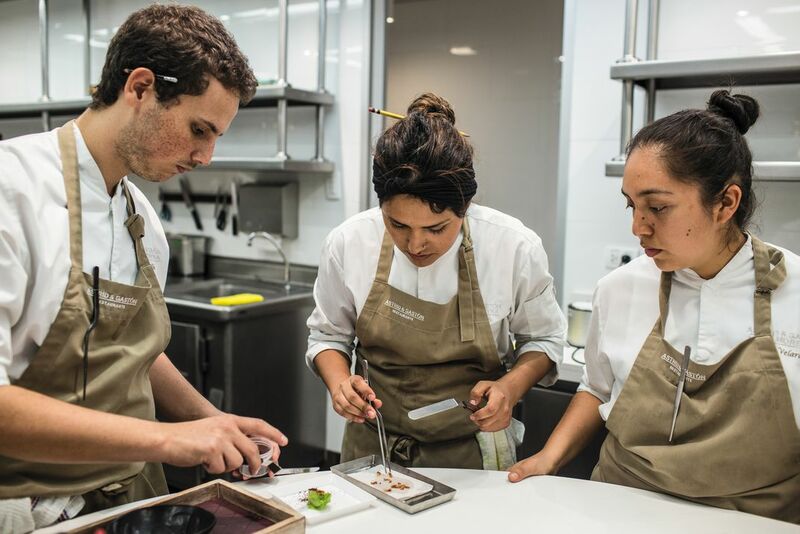 Cooking professionally has become something to aspire to, and about 80,000 young people from every social class are currently studying to be chefs, in schools scattered across Lima. 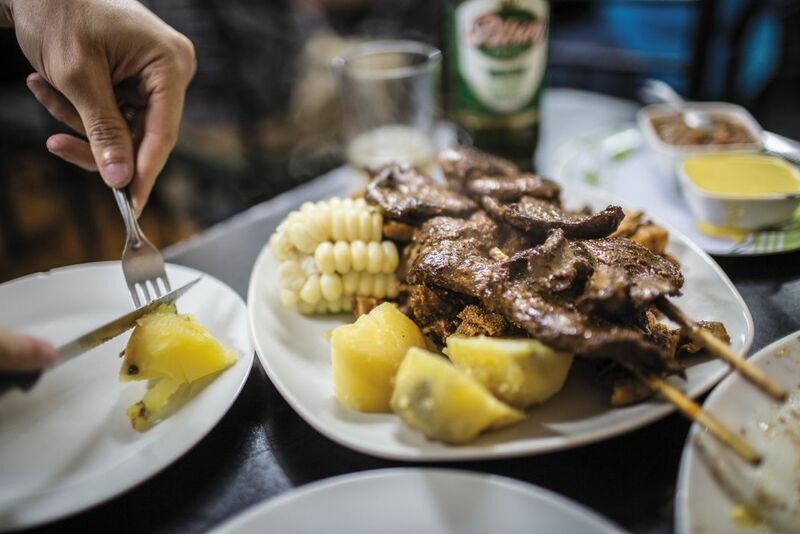 It all took off in the mid-1990s, during the war, back when Peruvian food was seen as something you ate only in your house or, if you were a risk taker, out in the street. The shift happened at a small restaurant called Astrid & Gastón. The owners of the restaurant were a young couple—she (Astrid) is German; he (Gastón) is Peruvian—and they had studied cooking in Paris. So Parisian food was what they made, until one day when they tired of serving standard French dishes on white tablecloths. They decided to serve Peruvian cuisine, with the same respect and care afforded European cuisine, if not more. The decision would inspire an entire generation of young chefs, and eventually help elevate Peruvian cuisine across the world. Astrid & Gastón recently celebrated 20 years in business by moving into a former palace in the heart of San Isidro, Lima’s financial district. The space has a regal aura and a futuristic electricity. Each day chefs harvest vegetables from their own gardens, which are adjacent to the building and are referred to as “Eden,” carry out culinary experiments in a workshop-laboratory, and offer public conferences and cooking classes in an open-air patio. Astrid & Gastón is now as much a cultural center as it is a restaurant. The new space cost six million dollars to renovate, itself a clear sign of changing times in Lima. 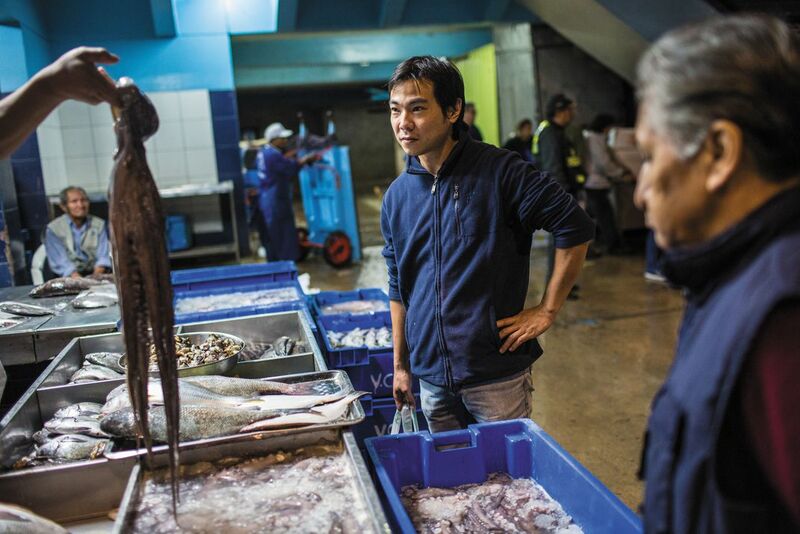 Now middle-aged, Gastón Acurio oversees an empire of about 50 restaurants all over the globe. But nothing compares with the tasting menu offered at his flagship restaurant in Lima. That menu is called Virú (an indigenous term that is said to refer to modern Peru) and consists of 28-30 small plates served over the course of three hours, showcasing ingredients and techniques from all over Peru. 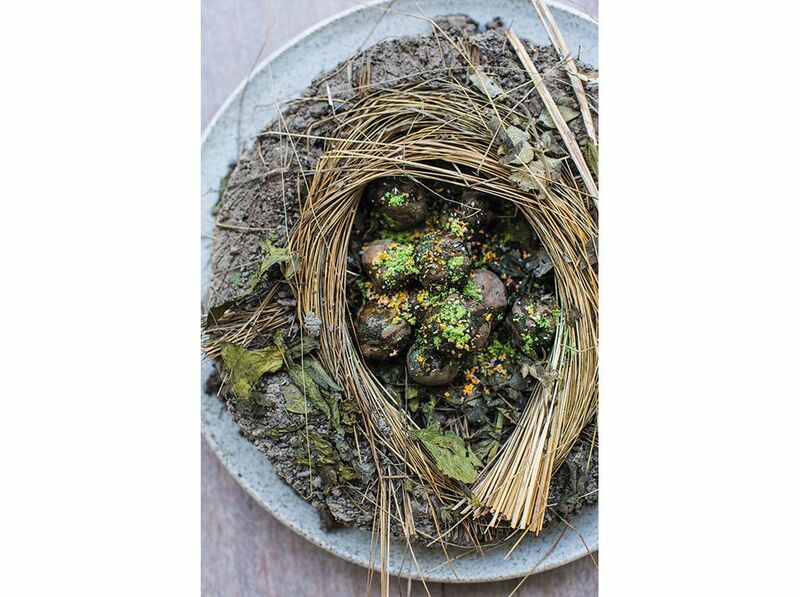 One dish is a hunk of earth and straw, and contains three cooked potatoes. Diners are supposed to dig out the potatoes using their hands, to mimic the way people live and eat in the Andes, where more than 4,000 varieties of potatoes are grown and often cooked in the ground. At Astrid & Gastón, a successful dish is one that tells a story about Peru. 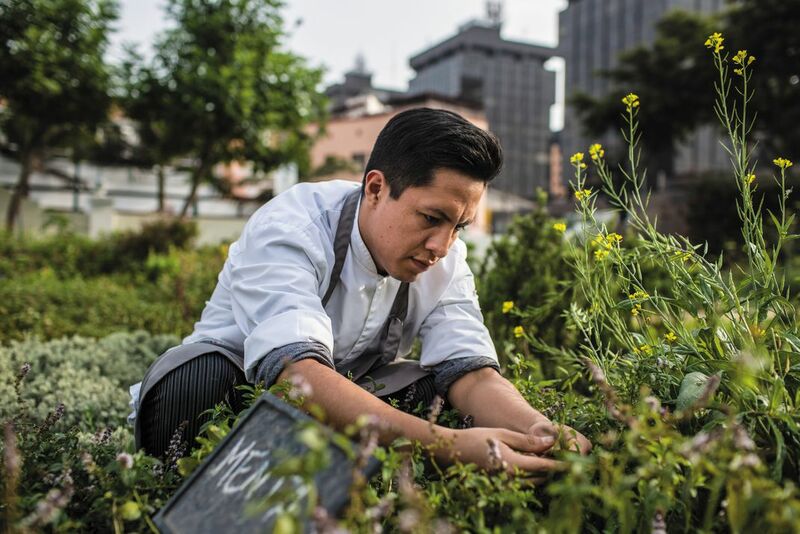 And increasingly, a successful chef is an ambassador who shows us the world outside the walls—real and imagined—of Lima. My first trip outside Lima got cut short. It was 1995; the army and the guerrillas of Shining Path were still fighting in the Andes. I was 16 and far more ignorant than intrepid. 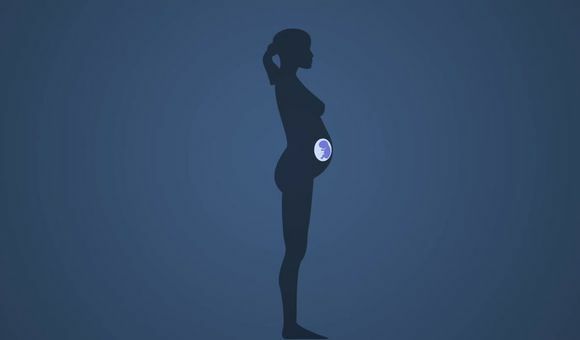 I hitched a ride on a cargo truck on its way to the Amazon, with the idea that I’d turn around when the driver kicked me off or my money ran out. The army was stationed at the entry to a town called Pichanaki, where a soldier who looked about my age glanced at my documents, then told me to go back to the city. The guerrillas had attacked just a few days earlier. I did as I was told. 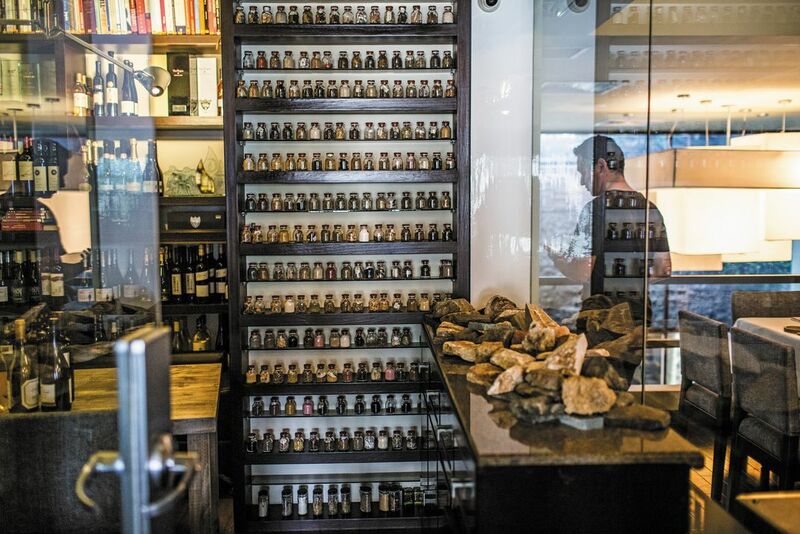 About 20 years later, chef and traveler Virgilio Martínez invited me to visit his office on the second floor of Central, a discreet restaurant just a few steps from the ocean, on a tree-lined street in the Miraflores district of Lima. It’s decidedly exclusive, a place where you should make a reservation at least a month in advance. Yet Martínez’s office looked more like a biologist’s lab or an art installation. It was filled with glass vials. 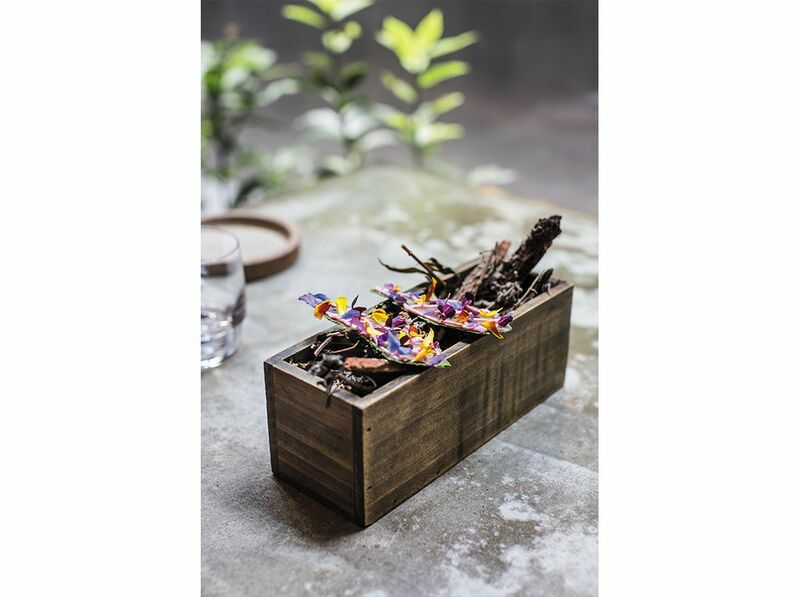 Each one contained a seed, a root, or an herb that Martínez had brought back from his adventures. He showed me photos from his most recent trip into the Andes. There was an image of a frigid lagoon perched at an elevation of more than 13,000 feet, where he’d collected sphere-shaped edible algae. And there was one of him cooking beet soup in the home of some local farmers. 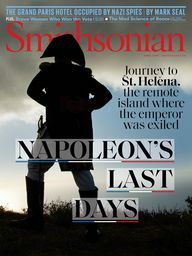 His cuisine was a reflection of all the time he’d spent traveling across the country: Since peace was established, it has become infinitely easier to get on a bus or a plane and see Peru. The country’s geography is like a staircase in the form of a letter A. 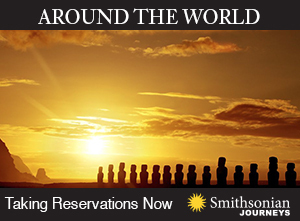 You begin at the Pacific, ascend to the highest peaks of the Andes, and then descend the other side into the Amazon jungle. 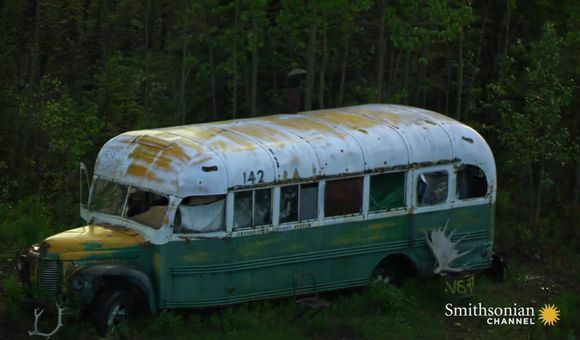 The full journey passes through 84 different ecological zones, each one with its own species of plants and animals. The tasting menu at Central reflects that diversity and is organized by altitude. 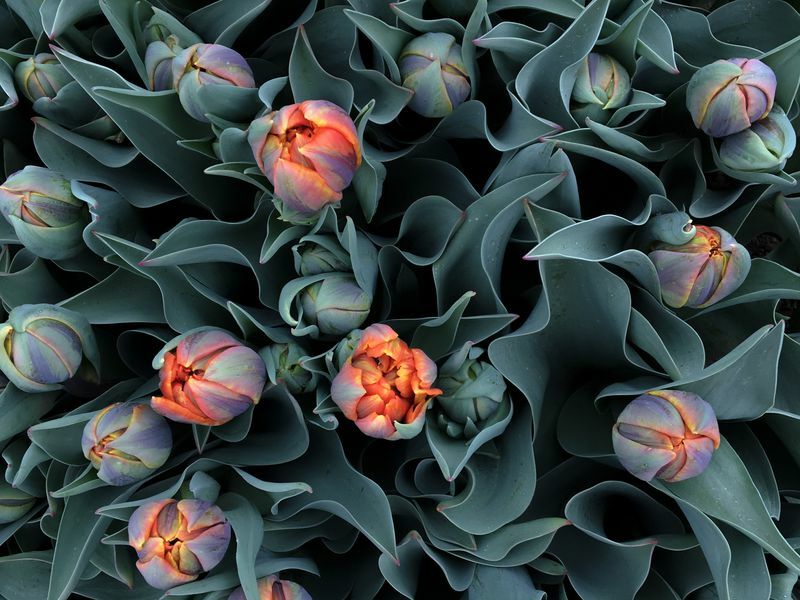 “Bivalves and corals. Lima Ocean. 10 meters.” “Different varieties of corn. Low Andes. 1,800 meters.” “Frozen potato and algae. Extreme altitude. 4,100 meters.” Not so long ago, when the city was locked away and absorbed by the war, this kind of diversity would’ve been impossible to imagine. 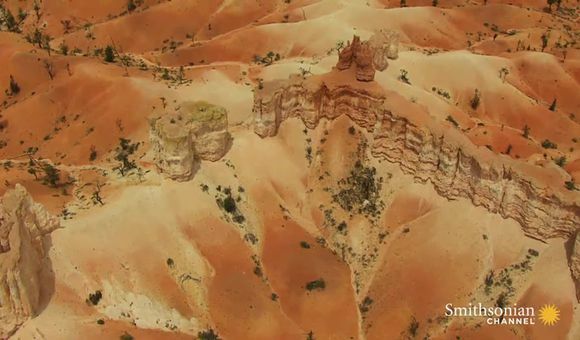 Today, even though most Limeños now go out to bars and restaurants, many people remain frightened by the thought of traveling outside the city. Yet young chefs like Martínez are helping to break that taboo. Chef Pedro Miguel Schiaffino runs Malabar and Ámaz, which both specialize in Amazonian cuisine. Schiaffino is a friend, and a few years ago I accompanied him on one of his monthly trips to the jungle. (Full disclosure: I occasionally consult for Schiaffino on social media strategy.) On that trip, we started out at the Belén market in the river city of Iquitos, where it was about 100 degrees Fahrenheit. Stevedores unloaded rodents the size of small pigs off ships, as well as lizards and monkeys. Local delicacies such as piranha and edible larvae called suri are cooked on grills. Fruit sellers showed off products like caimito, a citrus fruit nicknamed the kissing fruit, because eating it is supposed to be like getting kissed. By afternoon, we’d left the market, and Schiaffino was submerged in a lake, along with a group of local men who were casting for paiche, a prehistoric-looking fish that can weigh over 400 pounds and is often called the king of the Amazon. Everyone was surprised when Schiaffino managed to get his arms around an adolescent paiche and hoist it gently to the surface. He showed us the fish with a quiet sort of pride, as if he and the creature were old friends. Schiaffino started to travel to this region in 2003, when many of his colleagues in Lima were still hung up on the idea of molecular cooking, mimicking European chefs by transforming local ingredients into foams, gels and other novelties. Eventually Schiaffino moved to the Amazon for about six months, and what he learned there changed everything for him. After returning to Lima, he opened Malabar and, ever since, it’s been considered a kind of secret gateway into unknown culinary territory. Today you can see his love of experimentation in little details, such as how the fish in his ceviche isn’t marinated in citrus but in masato, a fermented yucca beverage that indigenous Amazonians have been drinking for centuries. Everyone knows that in Lima you can find thousands of delicious riffs on the city’s ceviche, but Malabar’s version will take you the farthest away from the city. I never wanted to leave Lima until I fell in love with my wife, who’s from the United States. Over the past few years, I’ve learned firsthand what a radical change it is to be away from the city’s food; in some ways it feels more drastic than speaking a different language. Now whenever I go back, the most important part—after seeing my family, of course—is deciding where to eat. A new tradition is to have our first and last meal at El Timbó, a roast chicken joint that my father always loved. (While the Lima of my childhood had few restaurants, places offering rotisserie chicken or Chinese food were the rare exceptions.) Timbó still bravely hangs on to an aesthetic straight out of the 1970s—wood paneling, faux-crystal chandeliers and plenty of mirrors—and it has perfected the art of rotisserie chicken, which a Swiss immigrant is credited with introducing. The classic dish is a quarter chicken browned over a wood fire, french fries and salad. Though it doesn’t sound like much, Timbó uses a marinade that borders on magical, and the plates come out with a whole palette of bright, delicate sauces that complement the dish perfectly. When we’re in Lima, my wife also makes sure we get to Kam Men, a Chinese restaurant in Miraflores that she sweetly refers to as “our chifa.” Chifa is the word Peruvians use for Chinese-Peruvian fusion, mixing local ingredients with Chinese recipes and cooking techniques collected over about two centuries of immigration. Like Timbó, Kam Men is an old-school spot that hasn’t yet been touched by the purposefully cool aesthetic of the culinary boom. Much of the dining room is made up of private booths cordoned off by pomegranate- colored curtains. When my wife and I lived in Lima, we marked important occasions there, always with the same dishes: dumplings, roast duck and a platter of curried noodles with beef. But the most important place to eat in Lima is at home with my family. Back when Lima was a city in the midst of one long blackout, when restaurants were few and far between, and eating out was considered dangerous, this is what we did. 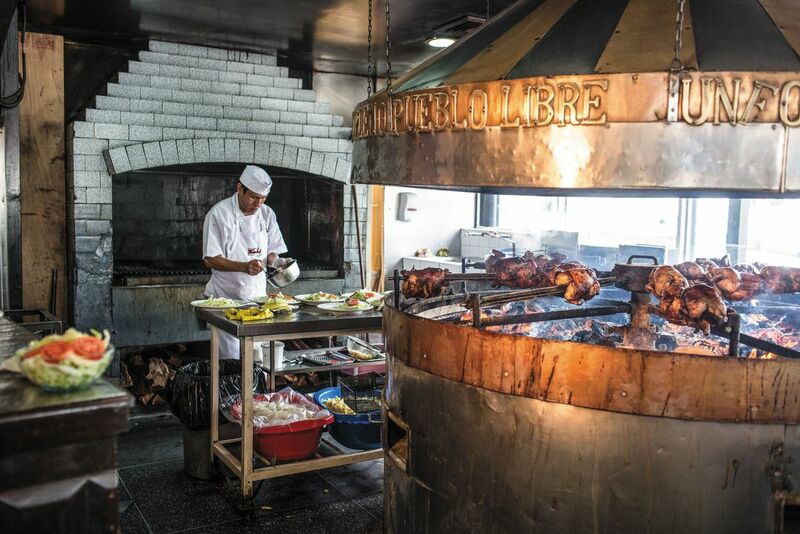 All over the city, we hid in our houses with our families and prepared variations of recipes now served in the thousands of restaurants that have made Lima famous as a culinary destination. Ceviche. Ají de gallina. Arroz con pollo. Tacu tacu. Papa a la huancaína. Lomo saltado. In Lima, these dishes are our monuments, the closest we’ll ever get to an Eiffel Tower or a Statue of Liberty. So when you taste them at one of Lima’s sleek, energetic restaurants, try to imagine for a moment a different city, where millions of people savored meals with their families in quiet, dark apartments, thinking about homes they had recently left. Then you might understand where the culinary boom really began. Marco Avilés is a Peruvian writer and editor. His most recent book, De Donde Venimos Los Cholos (Where Do We Cholos Come From), chronicles the harsh treatment that his family and other people of mixed indigenous and Spanish ancestry receive.